Find all your outdoor adventure wear at Altrec, online at Altrec.com. Find products for camping, hiking, climbing, cycling, paddle, running & fitness, surf, skate, ski, snowboard, snowshoe, travel, yoga, and even more similar active adventures. Plus, find top brands of women's, men's, junior's, kid's, and pet's apparel, including Arcteryx, Columbia, Mountain Hard Wear, Keen, The North Face, and Patagonia. Find the hottest Altrec discounts, Altrec promotions, and Altrec codes at RetailSteal.com. Altrec offers free shipping on orders of at least $45 within the contiguous U.S., along with a 100% satisfaction guarantee and lifetime returns. Exclusions may apply. Write a review and save 15% at Altrec. Click here now. Don't miss out on free shipping at Altrec when you spend at least $48. Click here to start shopping for gifts! Buy discounted North Face gear at Altrec and save up to 60% on your order. Click link for savings. At Altrec, save during the outlet sale and get up to 60% off. Click link to save. 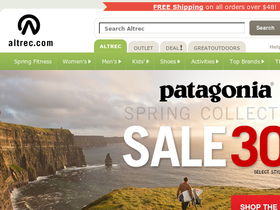 At Altrec, save up to 80% on discounted Columbia items. Click link to shop online now. Shop at Altrec for a limited time only to save up to 50% on select ski and boards. Shop Altrec.com and save up to 50% off many Columbia styles in this big fall sale. Click to shop. Shop at Altrec for a limited time only to save up to 50% on Billabong sale for both men and women. Click to save. Save during the Running and Fitness Sale, and enjoy up to 50% off your order at Altrec. Click link for savings. Shop at Altrec, and save as much as 40% during the Women's Shirt Sale. Click link to save. Buy Osprey Packs and save up to 15% on your order at Altrec. Click link to save. Act now and take advantage of a 20% discount on ski and snowboard gear from Altrec.com with this coupon code. Exclusions may apply. Act now and take advantage of an extra 14% off the weekly specials from Altrec.com. Use coupon code online to save.